A good description of care of hand knits. 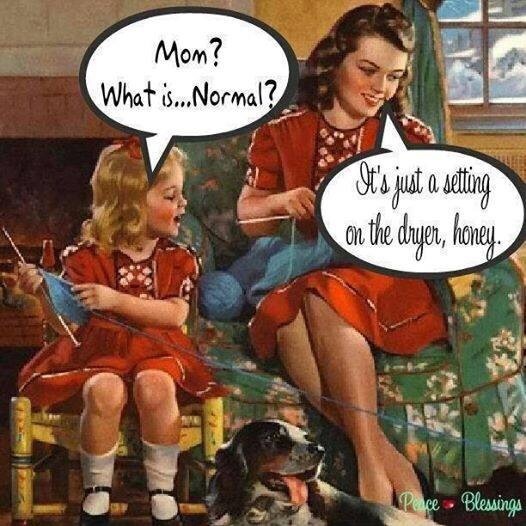 I have been washing on delicate in my machine but I have found that my socks are slowly felting and getting smaller. Especially the ones made from Blue Moon Yarn. I need to get busy replacing some of MY socks. Maybe I’ll cast on a pair today. Happy knitting! 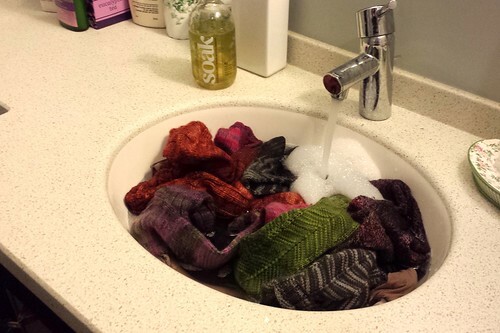 Occasionally in the course of blogging about knitting-related things, I get asked how I wash the things I knit. 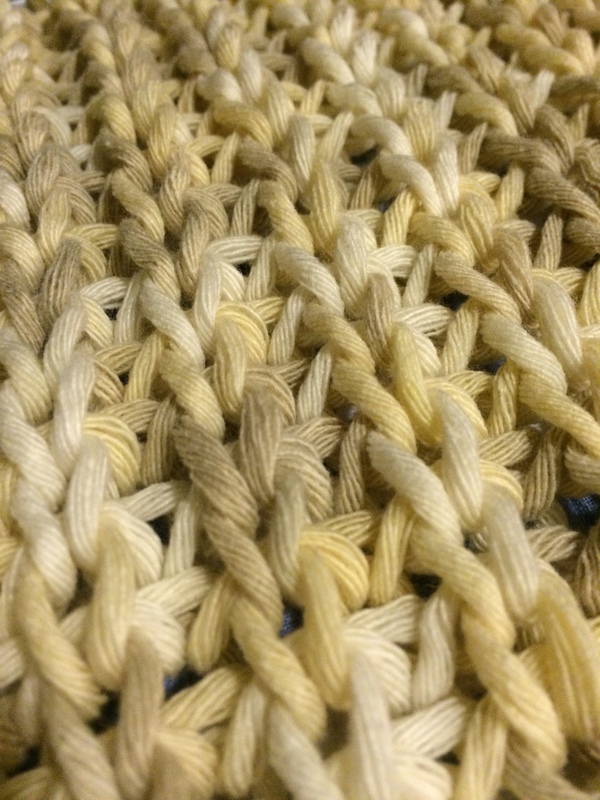 After about ten years of producing knitted things that get worn, I’ve gotten a bit of practice washing them (and I do indeed like to wash the things I wear), and actually it turns out that this is not a terribly complicated thing to do. The internet is full of advice on things like this, but here’s what I do. No matter what I have on my needles, I am always easily distracted when my husband says, “I wish I had……..do you think you could make that?” Well, he has been getting back into fly fishing, and it is usually pretty chilly and damp on the river. A regular scarf isn’t practical with the ends flying around getting caught in the line or snagged by a hook. I had just made my cabled neck warmer and he said that would be the perfect thing for fishing, but plain and made of something that could get wet. So I dropped all my other projects to whip up a special neck warmer for his next fishing excursion. I decided to make the first version out of some Lion Brand Wool-Ease I had sitting in my stash, a little bit of wool for warmth and acrylic to keep it from shrinking and keep its shape. It is super soft too. 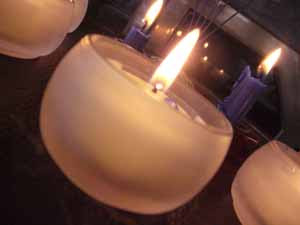 Reflecting about the winter solstice and went back to this post I wrote so many years ago. I think it is time to revive this tradition and make it one of our regulars. Our lives have scattered since then, the boys are grown, and Rose is about to fly. We need more traditions to keep us bound. Move into the light. It is one of those days where everything I touch leads to a project starting with trying to eat my usual yogurt and granola breakfast. I shook the last crumbs of our homemade granola into my tub of greek yogurt and decided I better make another batch right now if I want some for tomorrow. Brian usually makes it but that wouldn’t be till the weekend. Thankfully he keeps the pantry stocked well with all the ingredients we need. I thought I would share the recipe, many people have asked for it. It is pretty flexible, you can add or subtract things to your taste, don’t add fruit until after roasting it though. We usually measure by weight. I just tare my mixing bowl on the scale and add each ingredient, zeroing in-between. I include volume measurements as well, precise measurement is not critical in this recipe, so don’t stress. I mix it all up in my kitchen aid mixer with the dough hook on slowest speed. Mix just until blended. I use the dough hook instead of the paddle because it turns everything over well and is gentle on all the nuts and seeds. Then I spread this all out in my big turkey roasting pan sprayed with nonstick cooking spray. Roast at 350˚F stirring every 15 min until it is all toasty brown. The house always smells heavenly while this is going on. Let it cool completely and store in airtight container. Don’t store while still warm or the granola will get soggy, believe me I have done this. 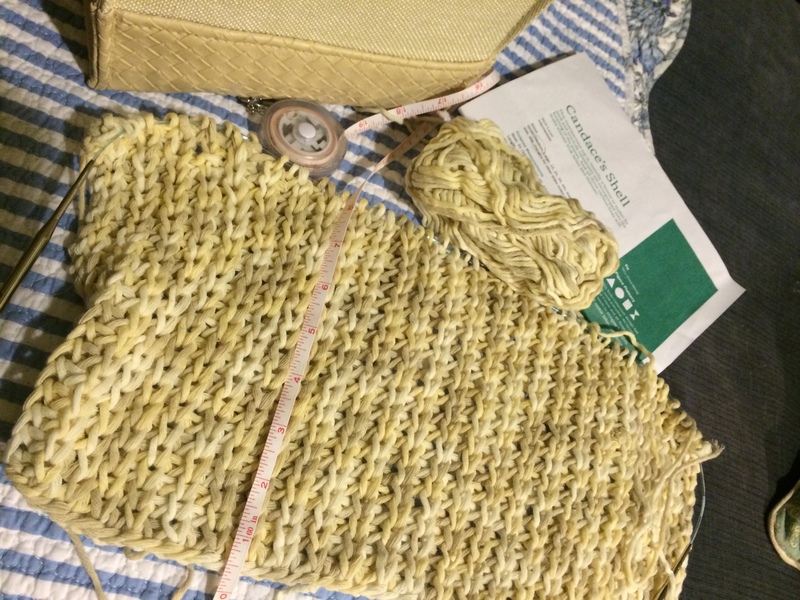 I joined TGKA way back in 2011 and ordered the Master Hand Knitting Program in 2012 but other than gather references, print out the instructions and then reorder the updates each year, I never really started. I have too many goals and two of them are big ones, this MHK and my CEN (certification in Emergency Nursing). I finally ordered specific yarn for may swatches; Wool of the Andes, bare from Knitpicks, and some Lionbrand fisherman’s wool as back up. I am not sure why I didn’t choose cascade 220 like most of the people working on this project are using. Hopefully the exact yarn we use doesn’t matter. 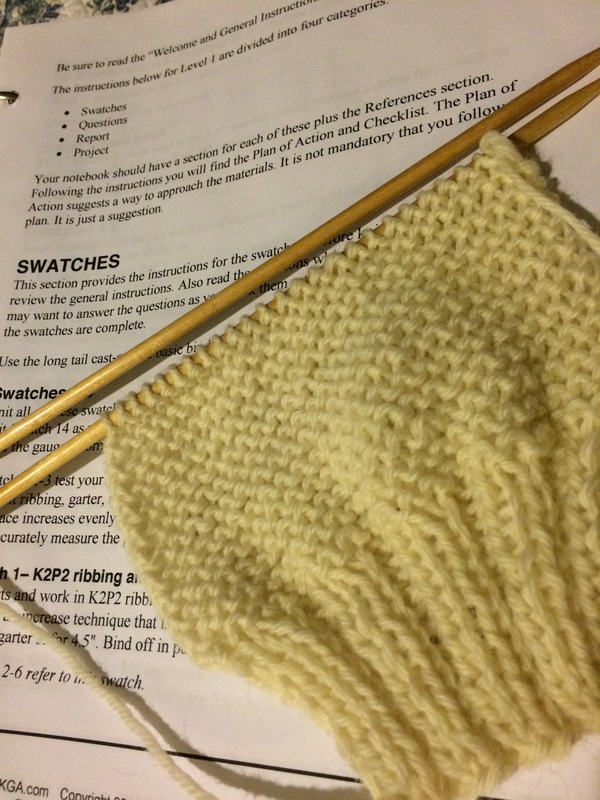 Last night I started knitting the first swatch and am already noticing every imperfection in my knitting. I have occasional loose stitches in the field and sort of irregular selvedges. I think I will just keep knitting the first few swatches and block them before I pass too much judgement on them. 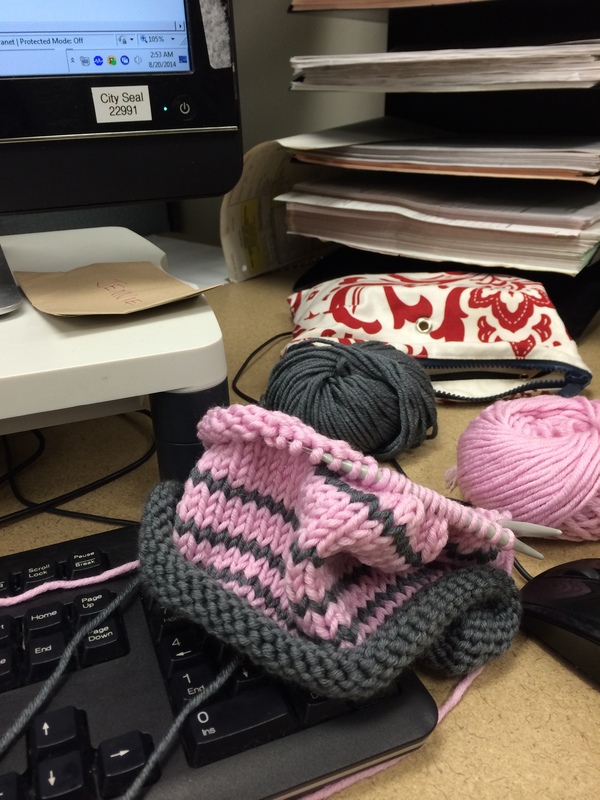 I keep going to the Ravelry page and reading about what everyone else is struggling with and how they handle it. I find I waste a lot of good knitting time reading when I should be knitting. Here is the start of my first swatch. Baby steps. 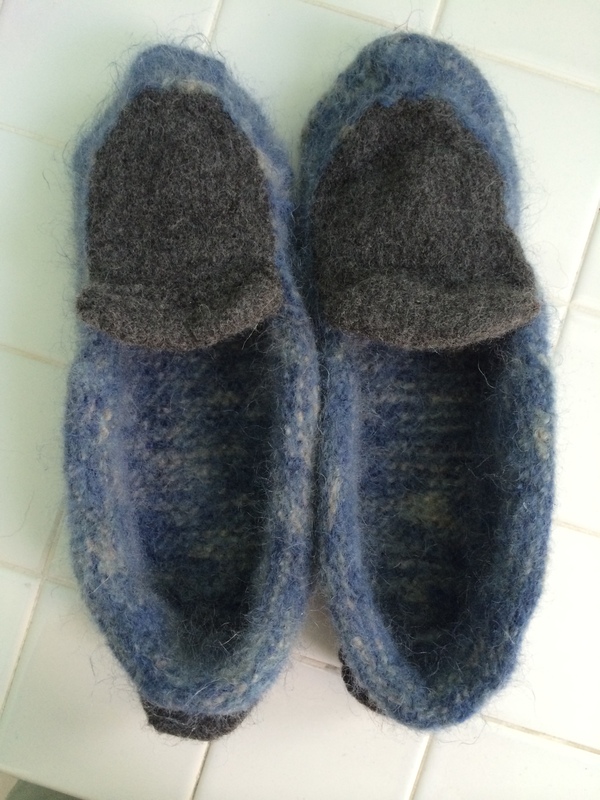 Back in 2002, I made my husband a pair of the felted clogs that were all the rage then. 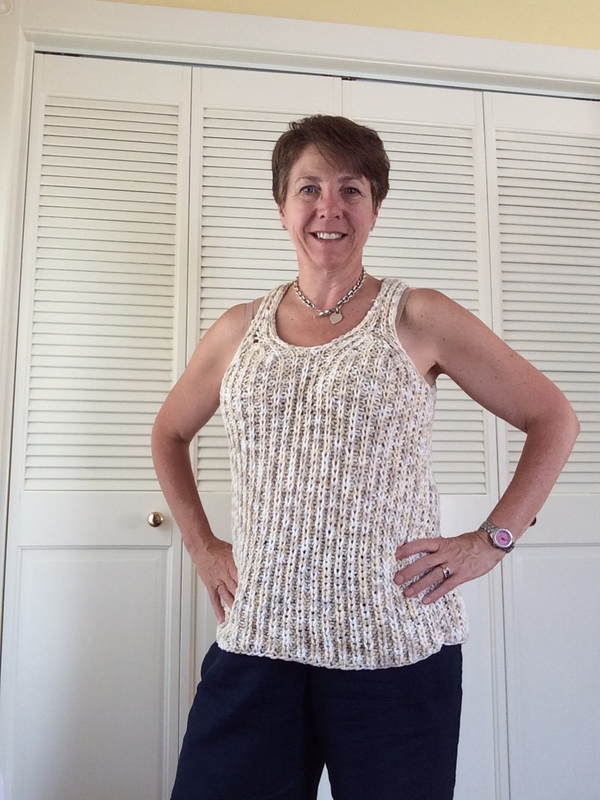 They were made using this pattern by Bev Galeskas for Fiber Trends. They lasted about 4 years without leather soles. I ended up making them for myself and one of my kids too. Mine and then Joe’s. I added leather soles to Joe’s and they have worn well. The next pair I made for hubby, I put leather soles on and he wears them in the yard and garden and taking out the trash and everywhere. They have lasted about 8 years now, but they are wearing out from the inside. I decided I would try a new pattern and my hubby, who does not do well with change, graciously said he would love any pair of slippers that I made for him. 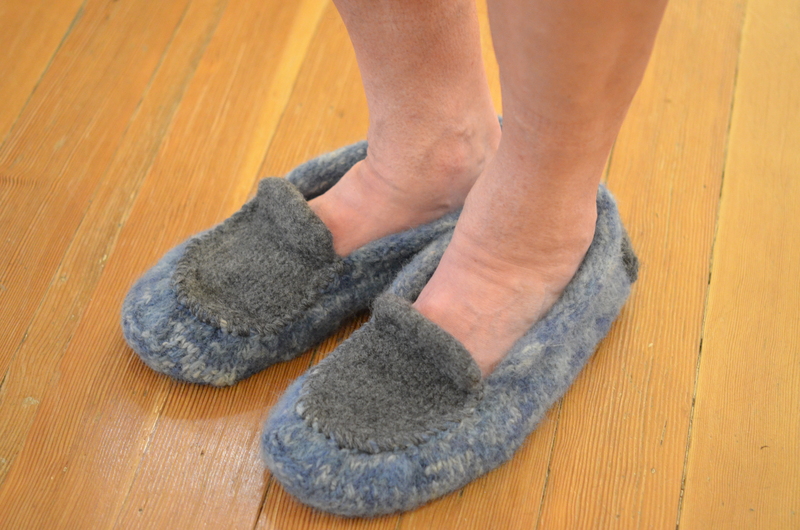 So I decided to use Julie’s Men’s Felted Mocs at Lavender Hill Knits. I had some yarn that I purchased many years ago on a trip to Vermont, it would work perfectly. I had already made a hat for a friend from it but I was pretty sure I would have just enough to make the slippers. Using the yarn doubled to get gauge I had just enough to make two soles with sides. I had just this much leftover! Whew! 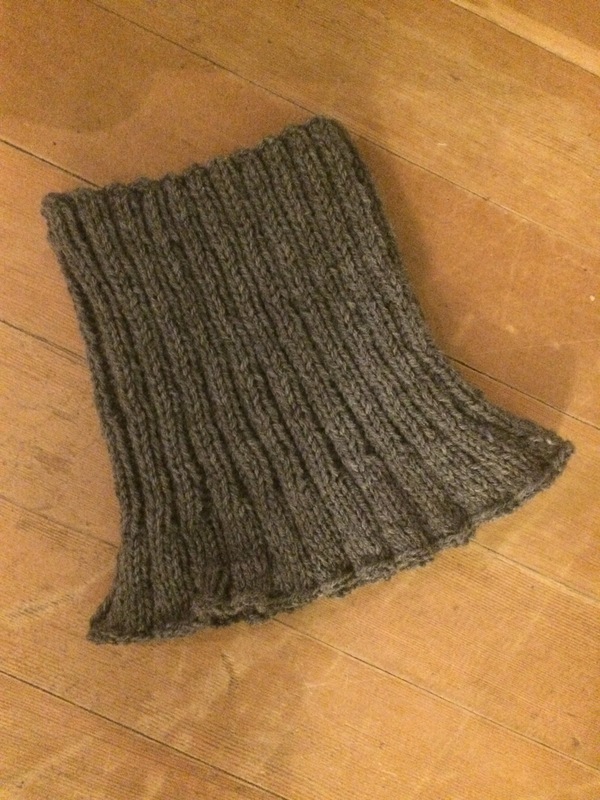 So I made the uppers and the heel flaps with some Cascade 220 in a charcoal grey that I had in my leftovers basket. I think it blended quite nicely. As with all felting projects, the knitting always ends up looking so huge and I never quite believe that is is all going to work out. 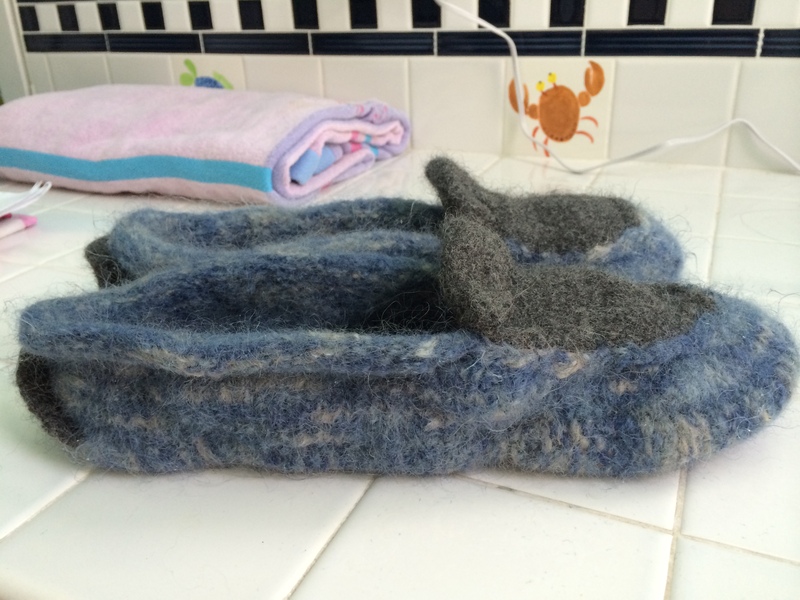 Here are the slippers next to MY feet, pre felting. Granted my feet are smaller than hubby’s feet, but still, they are huge. I felted them in my front loading washer. I usually have good luck with this even though “they” say you can’t use a front loader for felting. I just put them in a lingerie bag, then toss it in the washer with a beach towel and a pair of old sneakers. I set a custom program to hot wash and no spin and pray. Here they are fresh out of the washer, I made Hubby try them on while they were still wet; he is such a trooper putting cold wet wool on his bare feet while I fuss about whether they are the right size or not. They seemed a little big to me but he likes them roomy, so we let them dry in the air for a few days. I felt that this pair would look better with the leather patch type soles than the full soles that I usually use. 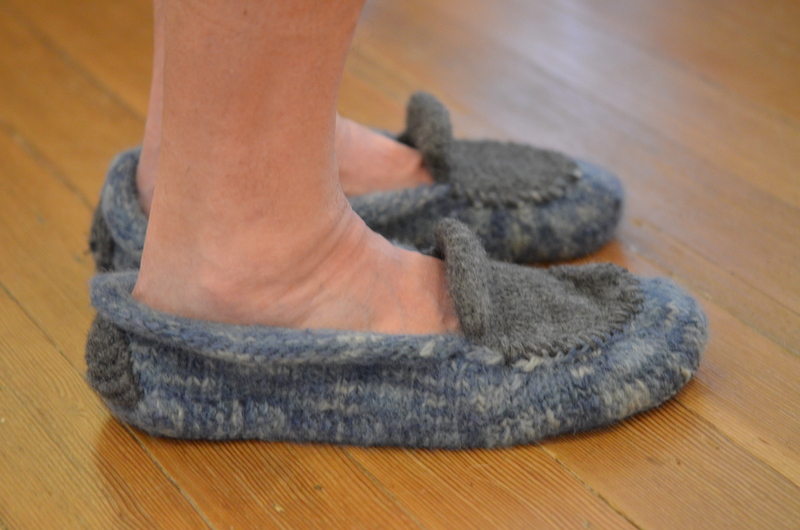 I also used the grey yarn to whip stitch around the uppers and tack down the decorative heel flap. 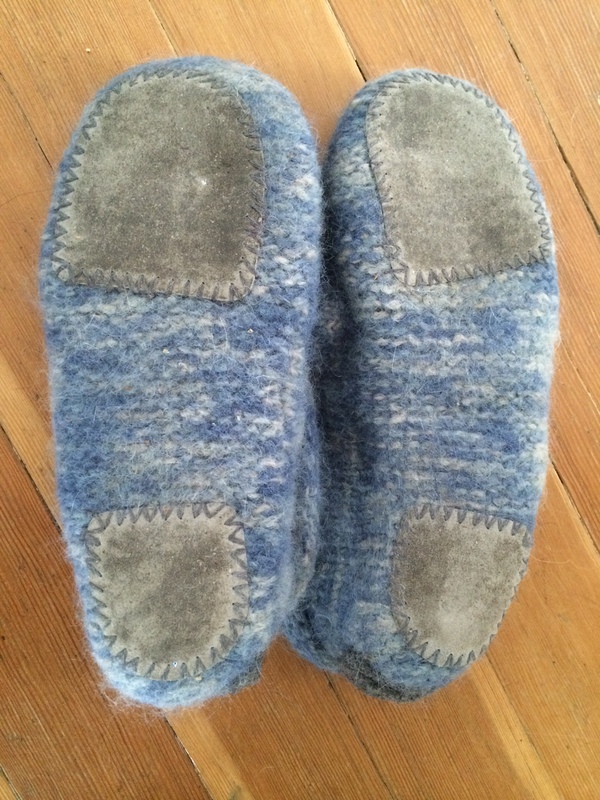 The sides of the slippers curled more than the sample in the pattern, but Hubby is happy with them and has worn them every night since I finished them. He promises these will not go in the garden, he’ll use the old pair for that. Here are his happy feet. I never seem to get enough salad on these hot end of summer days. So today I made two salads for dinner. I use the website Cookie and Kate as a resource and inspiration. 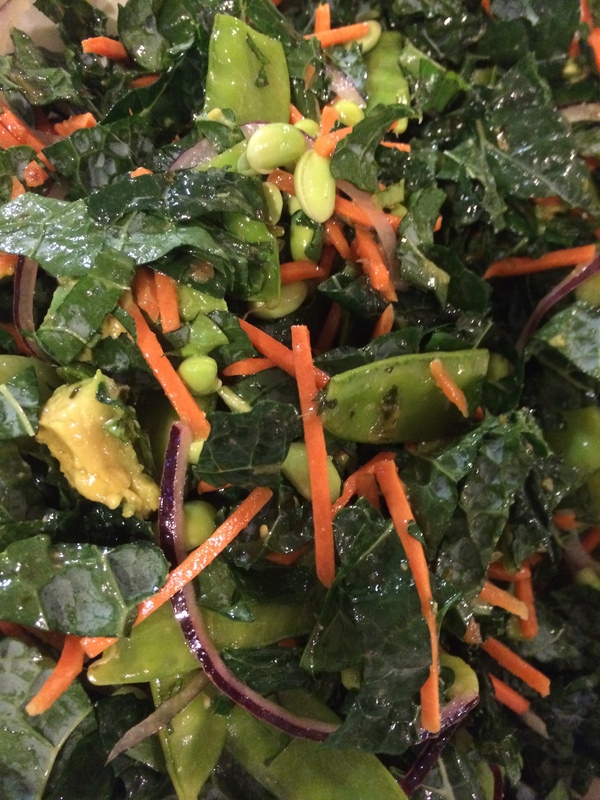 Kate has wonderful fresh veggie recipes, I want to jab at the screen with my fork because her photos are so enticing. I don’t always have the exact combinations of ingredients for the recipes, so I use them as a jumping off point. Here is what I made tonight. I had to pull it all together pretty quickly because I told my trainer, Ben that I would show up for boot camp at six, only an hour to pick stuff from the garden, pull out the veggie drawer in the fridge and chop, chop, chop. I don’t want Ben to think I’m lame and lazy; I already know that I am, I want to keep him fooled as long as possible so I have to go. I raided the garden for tomatoes, basil, parsley and mint. 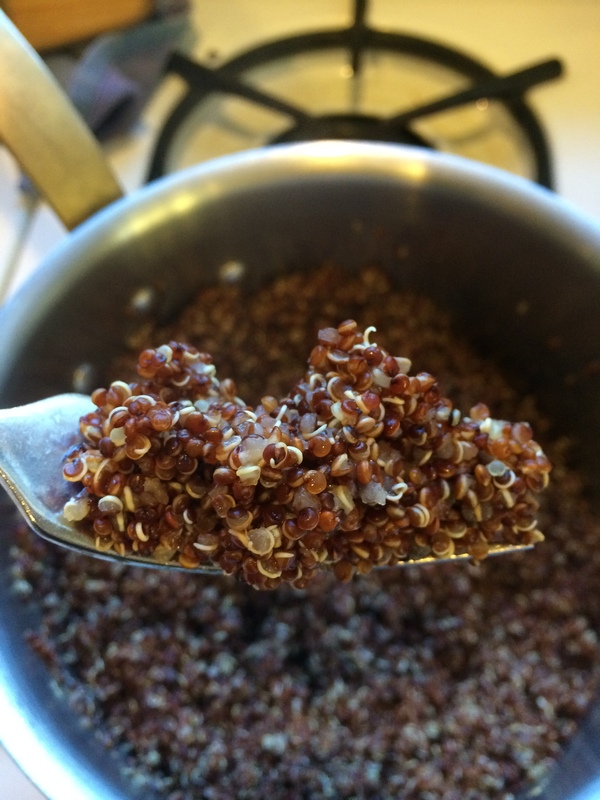 Rinsed my quinoa and started it cooking. 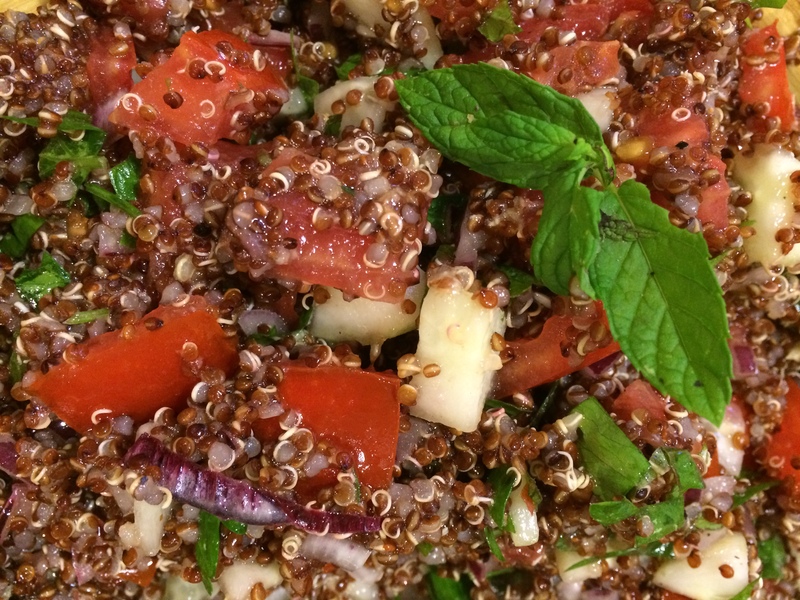 You have to rinse quinoa before cooking it, otherwise it can taste bitter. How do I know this? I am lazy and one time I didn’t rinse it and it didn’t taste as yummy. I also started blanching my frozen edamame. I didn’t have shallots that were called for in the recipe, but I found a half a red onion in the fridge and some sugar snap peas. 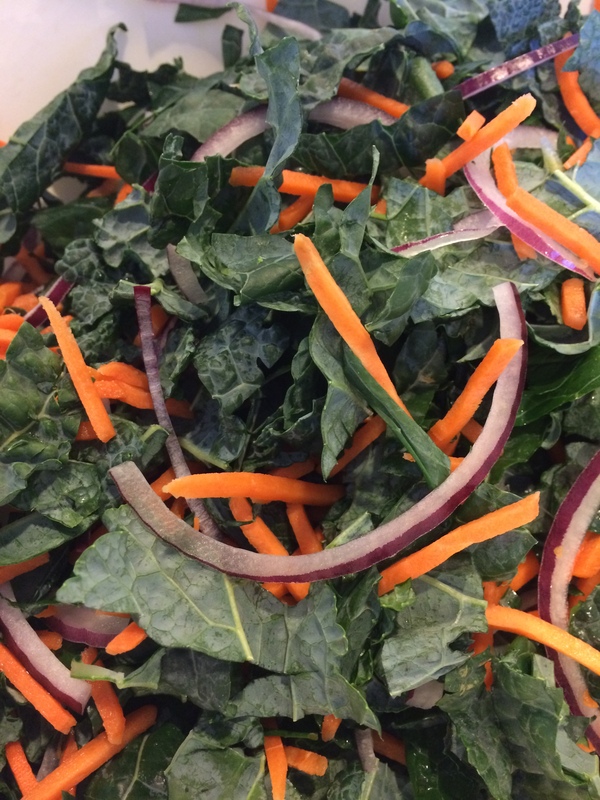 This time I used the tuscan kale, cutting the leaves away from the tough ribs and chopping the kale into bite sized pieces. Using my hands I scrunched the kale a bunch to tenderize it. Added the rest of the bag of shredded carrots I found in the veggie drawer. 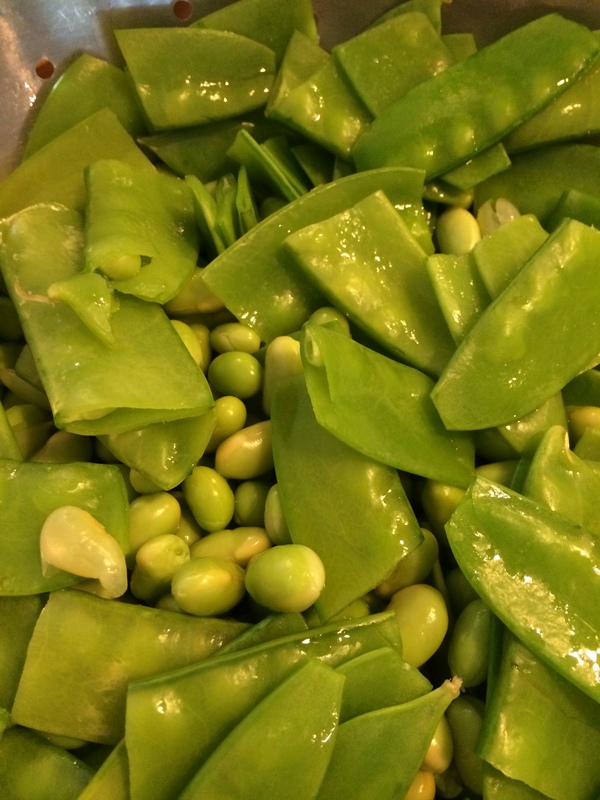 I added the sugar peas to the edamame at the last minute just to briefly blanch, and ran them under cold water. Here is the kale, carrots and onion getting friendly and blending flavors. Oh, and I tossed in the minced basil too,. I mixed put the dressing: minced ginger, and cilantro both from a tube I keep in the freezer, a bit of garlic, rice vinegar, soy sauce and olive oil. 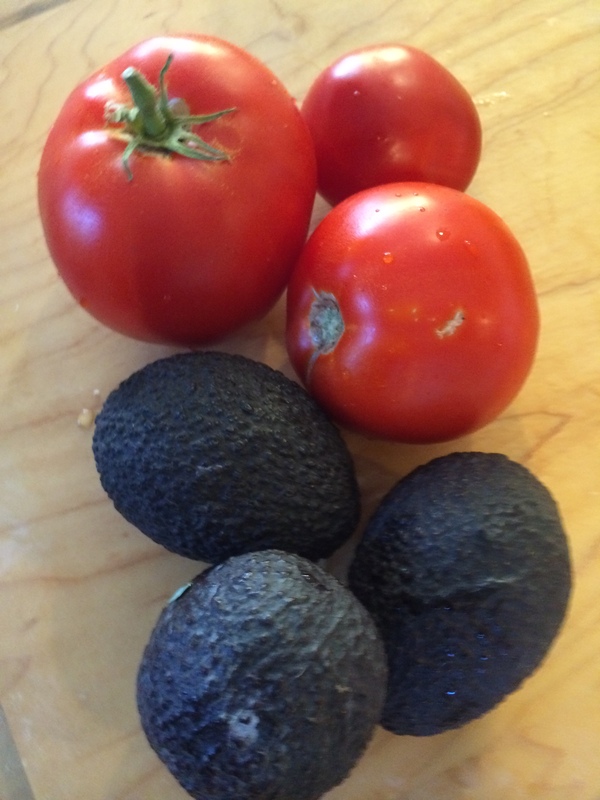 I set this all aside with the two ripe avocados ready to cut and mix just before we eat. Now the quinoa for the tabouli is done and I set it out to cool and started chopping the veggies. cucumber and red onion go into the bowl. I chopped the tomatoes into small dice, and minced the parsley and mint and tossed it all together. I raided the lemon tree for a couple of fresh lemons and squeezed them all over the salad, added salt, pepper, a bit of minced garlic, olive oil and a dash of red wine vinegar. Then I quickly shoved the salads into the fridge and threw on my workout clothes and ran to the gym. So we perused my stash and found a couple of balls of yarn that were part of a gift bag from a Mindful Knitting retreat I went to back in 2006. 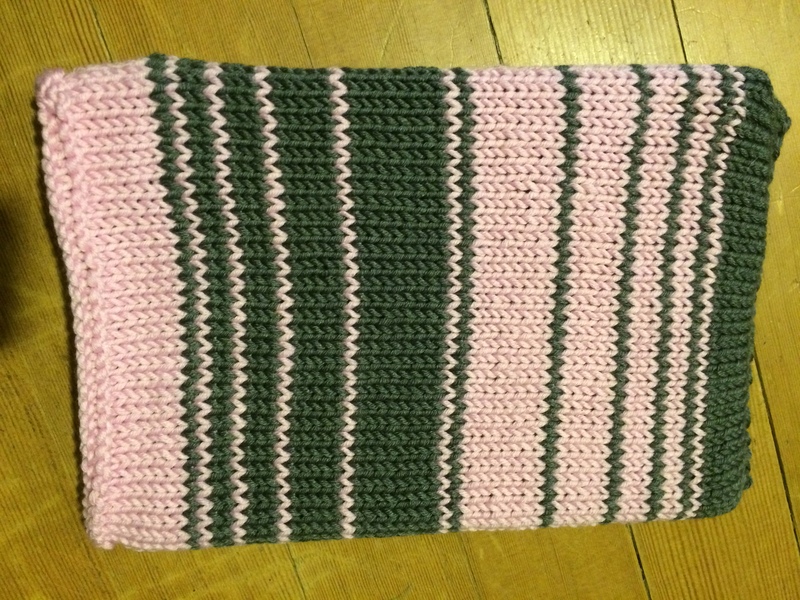 Pink and grey, really soft and just the right weight. 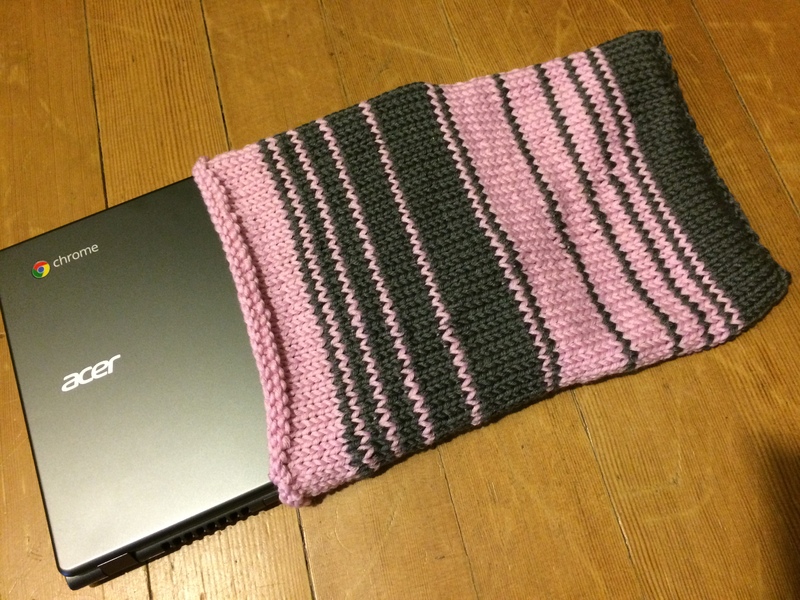 I swatched a little to figure out how many stitches I would need to go around the computer. I only had to rip it out once before I got it right. I decided to use this project to learn a new technique that I have been meaning to figure out for a while. The Jogless Join. 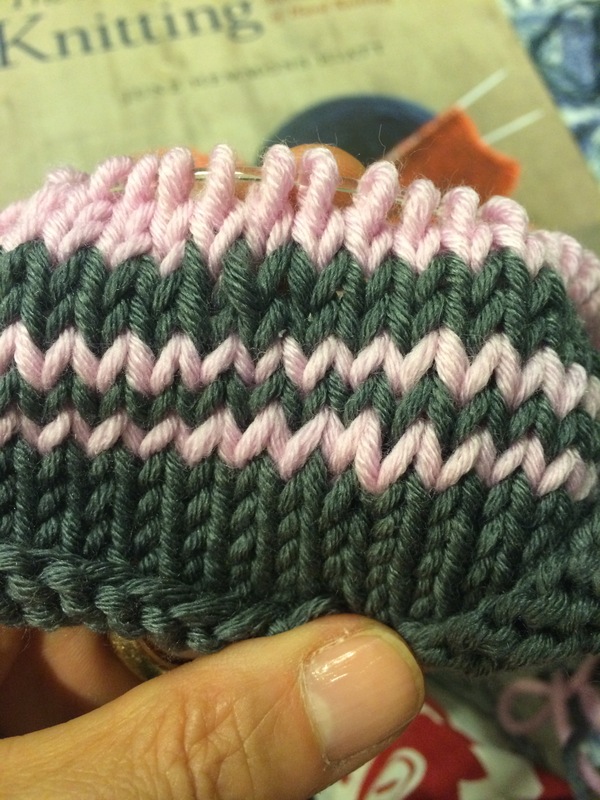 This is where you can change colors while knitting in the round without an obvious “jog” in the stripe. It’s pretty simple once you actually try it. Here you can’t even tell where the old row ends and the new row begins. Then we decided we would make the stripes in the Fibonacci series, since this was for school and she’ll be taking calculus and physics and all. I was impressed that she could tell me the code for the series. 1,2,3,5,8,13,21….. you add the two previous numbers together to get the next value in the series. The deadline turned out to be no big deal since Tuesday night was a rare slow night in the ER and I wasn’t assigned to the trauma zone. Therefore I could knit while I watched my admitted patients sleep. You can see the Fibonacci stripes marching out nicely, then in reverse so as to use roughly even amounts of each color. 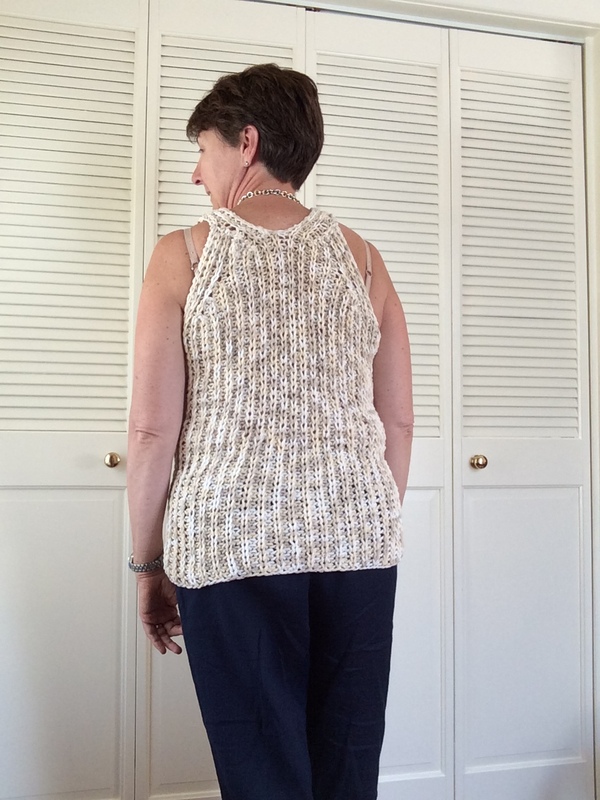 The pattern will be available on my revelry page soon. If you look closely you can see where the new color joins on each stripe, the beginning of the round moves over to the left one stitch each time. but overall I think it looks better. The finished product with a garter stitch open edge to prevent curling. Rose is happy and as soon as she showed her friends they immediately wanted one too. A sure sign of success with teenagers. I’m trying to work my way through my stash before I spend more money on yarn. I can’t remember what I planned to make with this particular yarn, It is Sirdar Spree, a bulky weight mostly cotton yarn. I made the Candace shell with it, just using about 3 skeins of the wight that I have. You can see it on my Ravelry page here. It was a quick knit on size US 10 needles. 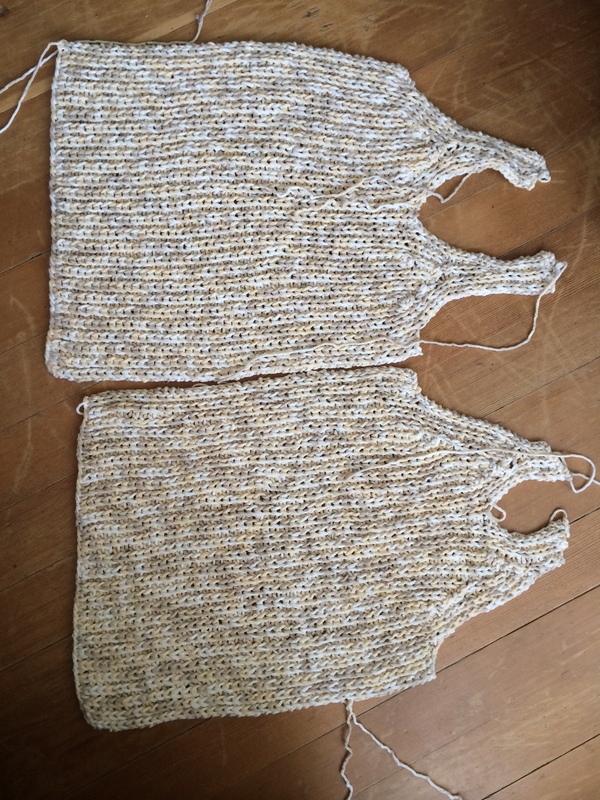 The pattern uses 13’s but I must knit extremely loose, I kept going down a size and knitting a swatch and still getting too few stitches per inch. 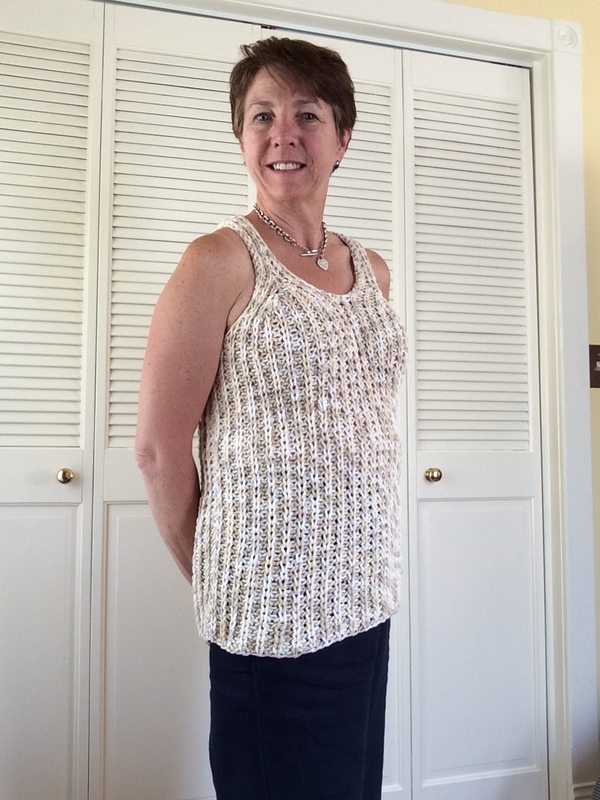 It will be a great top to wear for the rest of the summer. I might have liked a little shaping at the waist, even with the vertical ribbing, I find the bulky yarn just makes me look bulky too. The yarn is not that fun to knit with because it splits very easily, and catches on everything. The pattern itself fits me perfectly though, I knit it in the second size, The colors will look great with my linen pants. Now on to the next project, another sweater with some more stash yarn or a wrap with the rest of this yarn? Because it is totally normal that mom and daughter are sitting beside each other knitting in matching dresses.